Conveniently located in Sydney's central business district, adjacent to Darling Harbour, this intimate, full service apartment-style hotel specialised in personal service and quality accommodation. Situated in a modern building. This oversized guest rooms (all with balconies) and public areas were refurbished in 2004. spacious one-and two bedroom suites offer an ideal alternative to the traditional hotel room, complete with separate bedrooms, living/ work-areas and full kitchens. 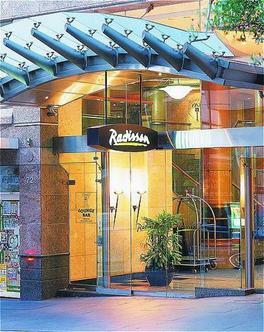 The One on 1 Brasserie and Bar, swimming pool, spa, sauna, fitness centre, business centre and car park complement the accommodation.International dining, myriad attractions, shopping, transport and entertainment venues are all within minutes walk from Radisson Hotel & Suite Sydney.Radisson Hotel & Suites Sydney has become the first hotel in Australia to allow their guests to contribute towards becoming Climate Neutral.